At the heart of New York City lies the junction of Seventh Avenue and Broadway, perhaps the most well known intersection in the world. As a kid, I stayed awake on New Year’s Eve and watched the ball drop in New York City’s Times Square at midnight. I was fascinated by all the billboards and the crowds of people. One Times Square provides the intriguing history behind one of the world’s most famous pieces of real estate. Broadway started out as a dirt path with the name of Bloomingdale Road. Near the end of the 19th century, theater impresario Oscar Hammerstein built two theaters in this area which led to several other theater owners to follow and create what is now known as Broadway. In 1904, the New York Times built its new headquarters on the intersection at an impressive height of 395 feet. This prompted Mayor George B. McClellan to crown the area as Times Square. Author Joe McKendry takes readers on an exciting journey through the following hundred years as the square serves as an information hub before television and the computer age take hold. I was particularly interested in the workings of the “Zipper” sign which broadcast breaking news on a five foot electronic panel. There are so many iconic images contained in the pages of this wonderful book. One of big themes of social studies is change over time. One Times Square would be a great resource to track U.S. history over the last century. McKendry documents the decaying of the square during the 60’s and 70’s and its resurgence in the ’80s. Older students can read this part of the text and discuss the pros and cons of urban revitalization. Before you watch the ball drop next Monday night, you should go and find a copy of One Times Square and amaze your friends and family with the interesting history of the area. If you’re looking for a way to inspire very young people to wonder about math and science, look no further than Infinity and Me! Infinity and Me will open up (dare I say it?) infinite possibilities and questions! How many stars were in the sky? A million? A billion? Maybe the number was as big as infinity. I started to feel very, very small. How could I even think about something as big as infinity? Uma proceeds to ask others how they conceive of infinity, and hears it defined in quantities of numbers, time, music, ancestors – even spaghetti! Finally, she settles on her own measure of infinity, quantified in something that is both personal and boundless. Full-bleed painted illustrations by Gabi Swiatkowska capture the magical sense of the endless immensity of infinity that at first perplexes Uma, and finally envelops her in understanding. In the end, it doesn’t matter how one envisions infinity; what does matter is kindling an interest in something broader, wider, more infinite than oneself. This is an intriguing introduction to a mathematical concept. Suggested for ages 5 and up. An interview with author Kate Hosford may be found at Archimedes Notebook! Another review and related activity at Simply Science blog. A curriculum guide for Infinity and Me is available on the author’s website. Copyright © 2012 L Taylor All Rights Reserved. Categories: STEM Friday round-up | Tags: math books, STEM Friday | Permalink. Do you know someone who has a special kind of connection with animals? My niece, Caroline, is one of those people. Animals just adore her. They trust her completely. Does Caroline have a future in veterinary medicine? Maybe. But that’s a tall order to put on a third grader, so let’s just say that interacting with animals is one of her special talents. 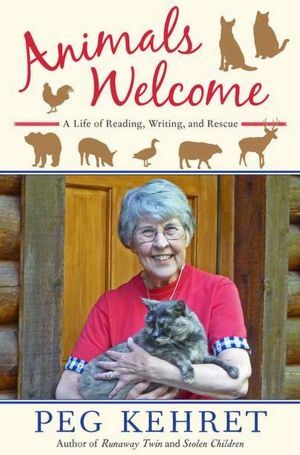 If you have someone like Caroline in your life, then here’s the perfect holiday gift: Animals Welcome: A Life of Reading, Writing, and Rescue by children’s book author Peg Kehret. This wonderful memoir describes the many animals Mrs. Kehret has cared for—pets, strays, foster cats, and even wild creatures—with brief mentions of how some of them played a role in her novels. Like Caroline, Peg Kehret, clearly has a way with animals, so I can’t wait to share this lovingly written true story with my niece. Each year, two organizations call attention to fantastic STEM books for children–the American Association for the Advancement of Science and the National Science Teachers Association. Categories: Uncategorized | Tags: AAAS, Award-winning titles, Melissa Stewart, NSTA | Permalink. Booktalk: Far north in the Arctic Ocean on Wrangel Island, an orphaned polar ear cub struggles to find food. Without a mother to feed her, this young female must fend for herself. Due to rising global temperatures, food is hard to find because the pack ice that the bears rely on for hunting is late in coming. This past December, on another hillside, she was born in a snow den. even after she climbed out of the den in early April. Polar bear cubs usually stay with their mothers two to three years. But this cub is already alone–on her own.